Fifth and final festival of esoteric "Gift of Destiny" 23.09.2018. ! Ayurvedic massage Champi affects the body and soul, fills them with energy! Rest in goodness, joy AND HARMONY !!! Ajurvedic massage Champi: the impact on the body and soul, fills them with energy. The effect of massage is long-term deep. Massage affects all organs, the whole body. Muscular spasms in the humeral girdle, arising with a sedentary lifestyle and prolonged work at the computer, are removed. Champi consists of several elements of soft lymphatic drainage of the face and renders lifting effect, reduces puffiness. A powerful healing effect. Since the cerebral cortex is the control center of all organs and systems of our body, the therapeutic effect of the Champi massage is directed to the health effect of the whole organism as a whole. Caring for the health of the hair. During the procedure, therapeutic oil is used, so the champi massage has, in addition to the healing effect, a strengthening and stimulating effect associated with oiling the hair and scalp. Oiling perfectly strengthens and nourishes the hair. In addition to the moisturizing effect, the massage of the champi makes the hair much more elastic and firmer, improving blood circulation and nourishing the hair bulbs eliminating the puffiness of the face. Chumpy massage is a combination of elements of lymphatic drainage of the face and has a noticeable lifting effect due to reduction of edema. Improve concentration of attention. Champi massage significantly reduces pressure, improves memory, and also helps heighten anxiety, reduced concentration and apathy. 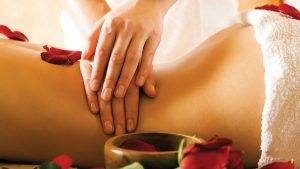 Ayurvedic massage Sambahana - healing massage + mantra. During the massage, the cleaning takes place, the illnesses that were outlined in the near future are deduced. Harmonization of karma. Sambakhan perfectly calms the body and mind, frees everyone, even the smallest, muscle. Ayurvedic massage begins with an energetic cleansing of the body, preparation of the patient for massage, followed by a series of massages - facial massage, ear massage, abdominal and breast massage, hand and foot massage, foot massage, back massage, neck and neck massage, head massage. Massage is a powerful soothing and anti-stress procedure. This massage is performed strictly on the energy lines (nadis) and marma-points, promoting increased circulation of pranic energy and balancing doshas. Manipulation with marma-points stimulates blood circulation and movement of lymph, which, in turn, strengthens the nervous and immune systems. this massage relieves mental fatigue, prevents mental and physical stress, balances and harmonizes body and mind, fills with energy, calms and reduces stress, removes salts, cleanses the gastrointestinal tract, supplies tissues with oxygen, removes toxins, produces therapeutic effect, improves blood circulation and lymph flow, purifies rejuvenates the body, harmonizes and balances, multiplies positive emotions and thoughts. Abhyanga is the oldest Ayurvedic procedure with the help of warm oil, which has practically no contraindications. Thanks to specially selected ethereal, base oils and medicinal herbs, abhyanga has a beneficial effect on the body, nourishing and rejuvenating the skin, improving the work of internal organs, beneficially influencing mental health. In the East, it is believed that life is blossomed from this mystical procedure, as it carries love and harmony on the energy level. Such a massage nourishes and rejuvenates the skin, eliminates toxins and toxins, normalizes sleep, strengthens the nervous system, increases the endurance of the body and psyche, leads the body to tone and harmonizes the doshas. Muscle clamps, which are a common cause of a large number of neurological problems, weaken after a massage. This facilitates the free movement of energy through energy channels and improvement of well-being. It is also believed that deep oiling does not allow penetration into the body of contaminants that trigger the development of diseases. Massage ayurvedic SAUNDARJA Massage for femininity, beauty, lightness ... using fine floral oils, various plant powders. Churnapinda has a pronounced anti-stress effect, stimulates lymphatic drainage, blood circulation, metabolic processes, strengthens the immune system, tones up muscles, moisturizes the skin and increases its elasticity. It helps you feel your Ayurvedic body massage with herbal bags. 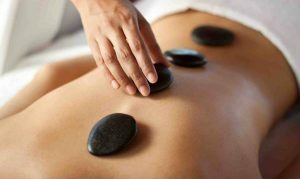 Ayurvedic massage with hot stones + chakra + mantra therapy. With the removal of negative energy, hot stones relieve chronic pain in the back and neck, help the muscles relax and get rid of aging slags and toxins, relieve stress, hypertonia. improves mental state. Heat and light pressure help to relieve muscle tension. 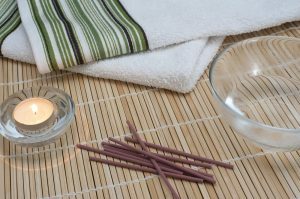 This surprisingly relaxing procedure helps to bring the body, mind and spirit into a state of harmony. Indian foot massage. Foot massage is known in India for several millennia. According to the teachings of yoga, the feet are a kind of switchboard. Indian foot massage - acting on certain points of this shield, you can influence the whole body. On the soles there are 72 thousand nerve endings. All internal organs have projections on the feet. It is safe to say that with the help of massage, you can purposefully change the state of the body. There are five main types of massage effect on the body; tonic, calming, trophic, energotropic, normalizing functions. At the end of the massage, you can massage your head. This massage also affects the harmonious state of the body. The result after the massage stops admiring. There is no weight in the legs, mazole or varicose veins, and insomnia also disappears. Massage very favorably affects the deformation of bones on the legs or flat feet, improves metabolism and circulation. The massage is very pleasant and relaxing. The feet will enjoy a scrub of salt, milk for the body, an emollient and nutritious property of the oil. Essential oils seem to envelop the aroma and affect the body as a whole. Energy massage and mikima chikitsa. Marma-chikitsa is an ancient Indian method of healing the body, one of the types of Ayurvedic technology with the use of individually selected essential oils and herbal infusions. The word "marma" in literal translation means "secret", "invisible". According to the Ayurveda philosophy, Marmas are the energy centers of the body, the points of the junction between the physical body and subtle energy flows. Most of these points are associated with certain muscles, organs or tissues like points in acupuncture. Influencing Marma points, a specialist normalizes energy flows, removes energy blockages, directs positive energy to specific organs and systems, and harmonizes the general state of the organism, gives strength or helps to relax. General - performed on the whole body, local - performed on separate parts of the body (head, back, feet, hands, abdomen). The chosen option depends on the duration of the procedure. Marma-ritual can be performed both separately and in combination with other Ayurvedic methods and procedures for the face and body. Marma-ritual stabilizes the energy balance, helps to eliminate the erratic outflow of internal energy, restores the disturbed balance between doshas, helps to cleanse the body, improves the functioning of the cardiovascular, immune, nervous systems, musculoskeletal system, optimizes blood and lymph circulation, treats cellulite and obesity , sexual dysfunction, has a rejuvenating effect, strengthens the immune system, relieves stress and fatigue, improves sleep, increases efficiency and vitality, brings a feeling of peace and tranquility. allergic reactions to used oils, benign and malignant neoplasms, acute inflammatory processes, severe diseases of internal organs, infectious diseases, skin lesions, pregnancy, critical days. Ayurvedic facial massage. Facial massage according to Ayurveda begins with rubbing of the shoulder joints, neck and head. Further, the master stimulates the biological points of these parts of the body. Actively studied muscles and soft tissues, blood circulation is restored. What is important, the lymphatic exchange and the removal of toxins from the skin of the neck and face intensify. All the time the massage feels tremendous relaxation. The tension goes from the muscles of the neck, face and shoulders, wrinkles are smoothed, the skin glows and becomes silky and rested. Thanks to relaxation and cleansing, the skin is tightened and becomes significantly healthier. 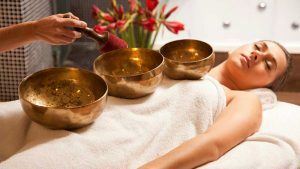 Features Ayurvedic facial massage is that in the process of massage normal pressure and heartbeat is restored, there comes a general calm of the soul and body. With the help of purposeful working out of biological points the organism is released from a lot of problems, both external, and infringements in work of internal organs. During Ayurvedic facial massage, stimulation of biological points responsible for certain organs and physiological processes in the body is carried out. The dark circles around the eyes go away, the vision becomes much better, the kidneys and liver work normal. The body wakes up, and positive energy appears in every cell of the body. 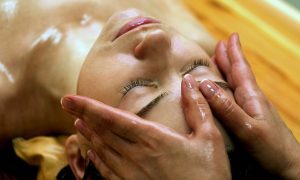 Facial massage in cosmetology is a unique method of rejuvenation. In the process of massage, both external and internal regeneration processes are activated. By means of the action on the points, the mechanism of renewal of the skin, the smoothing of wrinkles, relaxation of the facial muscles is triggered, the natural processes of cell renewal are restored. The tone of the muscles and the elasticity of the tissues of the face and neck come to normal. The effect of rejuvenation becomes noticeable after the first procedure. Yes, acupressure is not a panacea and a salvation from all ills, however it is a beautiful way, proven by centuries of practice, to restore the beautiful well-being, clarity of mind and cheerfulness of the spirit. This method is worth trying. And the use of essential oils adds not only a share of good, but also exotics in the process. Plus, essential oils - this is a powerful addition to the technique of acupressure, because even they are themselves excellent antidepressants, soothing and relaxing remedies. And with the right cocktail, as a result of such a massage, not only an amazing healing and regenerating effect is obtained, but also an instantaneous effect in changing the emotional state. If the soul is happy, then the body and face become younger for ten years. 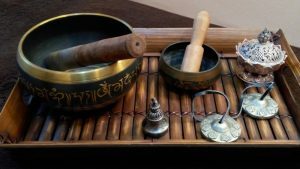 Sound massage with Tibetan singing bowls. This is a unique method of relieving mental stress, restoring the nervous system and the energy structure of a person. During the session, a person is affected by sounds and vibrations created by singing Tibetan bowls. At the same time, there is a soft massage of all internal organs, joints and ligaments, muscles relax, thoughts calm down. Sound fills and permeates the whole body, every cell and creates a sense of peace, weightlessness.